A new gene therapy approved! This week GSK’s ex vivo gene therapy for ADA-SCID received its marketing authorization from the European Medicine Agency. This is awesome news for the medical world and patients. ADA-SCID a disease characterized by a failure of the immune system evident by a lack of or malfunctioning B and T cells and is colloquially referred to as ‘bubble-boy disease’ Whereas SCID can be caused by a number of genetic mutations, ADA-SCID is a result of a mutation in gene coding for the adenosine deaminase (ADA). ADA-SCID accounts for 10-20% of all SCID cases. Individuals with SCID are at risk to life-threatening infections. It follows an autosomal recessive pattern meaning that you have a 25% child getting it if both parents are carriers. ADA is responsible for purine metabolism. Without it results in the toxic accumulation of metabolites that primarily affect lymphocyte development and function. Given ADA is also expressed in a number of other tissues, individuals also experience other complications such as motor function deficits, skeletal dysplasia, liver dysfunction to name a few. Current treatment for ADA-SCID is patient isolation, bone marrow transplant (BMT) to reseed a functional immune system, antibiotics, antifungals, and enzyme replacement therapy (i.e.injections of ADA) (ERT). ERT is primarily used as an acute therapy while patients await BMT. Survival post-BMT is good for those that are a donor match and poor for those that aren’t. Additionally, over the past two decades patients have had to promising gene therapy approaches through clinical trials. ADA-SCID is very rare i.e. 1 in 200,000 to 1 in 1,000,000 new cases per year. Patients are typically diagnosed in infancy and will die before their birthday without treatment. Strimvelis is an autologous ex vivo stem cell gene therapy. The patients hematopoietic stem cells are harvested from the bone marrow, are genetically modified through the insertion of a functional copy of the ADA gene into the host cell genome using a gamma retroviral vector. These transduced cells are capable of making the ADA enzyme and are re-infused back into the patient intravenously. GSK2696273 has been approved by the European’s Medicine Agency to treat patients who have ADA-SCID for whom no suitable human leukocyte antigen (HLA)-matched related stem cell donor is available. Of the 18 patients treated in clinical trials with Strimvelis all are still alive after a median follow up of 6.9 years. More so there have experienced a significant reduction serious infections through the reconstitution of their immune systems. It’s been a long road to say the least. 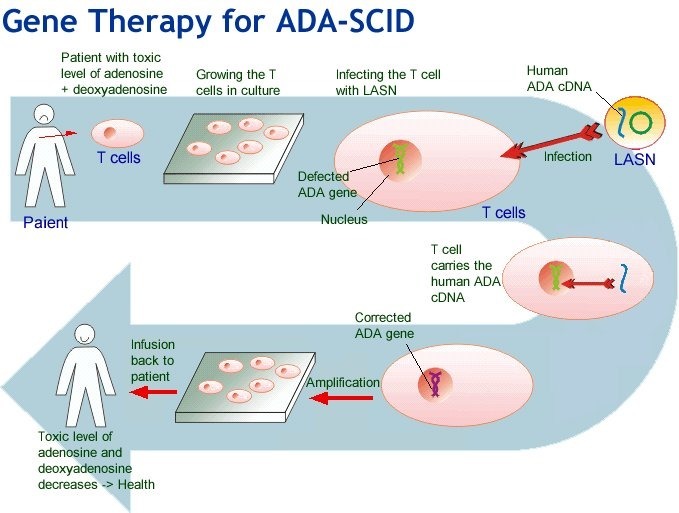 ADA-SCID was the first successful gene therapy to be trialed in humans in 1990. The first patient to be treated is still alive today. However the development of leukemia in 5 out of the 20 boys that received gene therapy for XL-SCID (another form of SCID) (4 were cured) and the death of a patient in a another trial for another disease put a hold to clinical trials. With this came a retraction of investment into the space. Following years of research and development into next-gen vector designs and further clinical trials, the promise of gene therapy was reignited towards the end of the 2000s. Strimvelis represents the first corrective gene therapy for children in the world. It is the second gene therapy product approved by the EMA, the first being Glybera for lipoprotein lipase deficiency. Pricing is always a hot topic for pharmaceuticals, and with the recent escapades of Valeant and Turing, it’s hotter than ever. Imlygic/T-Vec/talimogene laherparepvec – an oncolytic therapy by Amgen for the treatment of a specific stage of advanced melanoma. The expected price is US$65,000 for a treatment. While it has market authorization by the FDA and EMA, market access provided by the likes of NICE in the UK have rejected due there is no clear evidence that it “is as clinically effective as other drugs used to treat advanced melanoma”. Thus it lacked cost effectiveness. I am interested to see how GSK designs its organization in order to get these therapy to patients. Given it is an ex vivo therapy, cells harvested from bone marrow of the patient have to processed by a GSK facility – will this be centralized or will their be smaller satellite locations around the globe. How will they develop relationships with the physicians that diagnose these patients and what relationships will they build with the patients themselves? How will they need to transform medical provider facilities, staff and procedures to adapt to this new type of therapy? With a host of gene therapies, both ex vivo and in vivo, flying down drug development pathways we can hopefully expect a number other successes in the very near future. This entry was posted in Biotech/ Science and tagged Biotech, gene therapy. Bookmark the permalink.